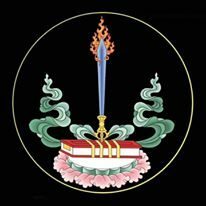 Recite the Four Names (of the Four Tathāgatas). And so it was that, as he prayed with inspiration in his mind, this was bestowed upon Rikdzin Düdjom Dorjé (Düdjom Lingpa, rig ‘dzin bdud ‘joms rdo rje) by the Lake-Born Vajra of Oḍḍiyāna [Padmasambhava] at Mardo Trashiy Gakhyil (smar mdo bkra shis dga’ ‘khyil), on the eighteenth day of the tenth month (the first month of winter, dgun zla ra ba) of the Male Water Monkey Year [December 1872 or January 1873], and was codified into writing by the scribe holding the name Orgyen (o rgyan), born into the family lineage of Takla Orgyen Gyamts’o (stag bla o rgyan rgya mtsho). Virtue! Virtue! Virtue!